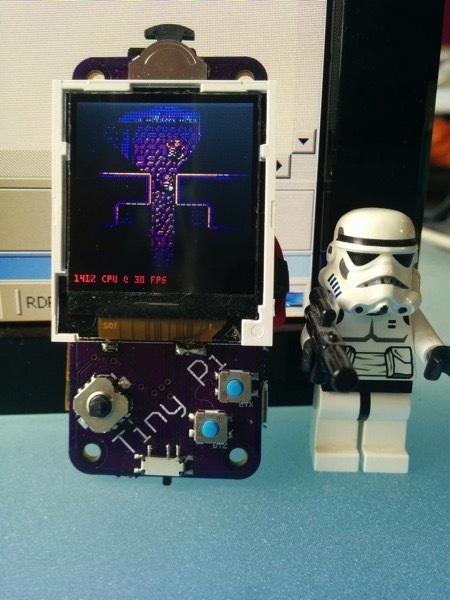 TinyPi – A Super Small Raspberry Pi Based Gaming Device @Raspberry_Pi #PiDay #RaspberryPi « Adafruit Industries – Makers, hackers, artists, designers and engineers! Nice tutorial from instructables user moosepr. So the first step is to solder the Pi to the PCB. This is a pretty tricky part of the process as the boards sit back to back and there are no headers. Your best bet is to watch the video. The first step to attaching the Pi is to prep the PCB. The 40 gold pads that the pi attaches to need to be ‘tinned’ with a small amount of solder. This will make it easier to get the boards to attach. Your next step is to clamp the 2 boards together. The best way is to use some M2.5 screws and nuts, and clamp the corners.